Religious Freedom in the World Report 2016. ACN’s comprehensive assessment on the threat to religious liberty today - published on Thursday 24th November 2016. 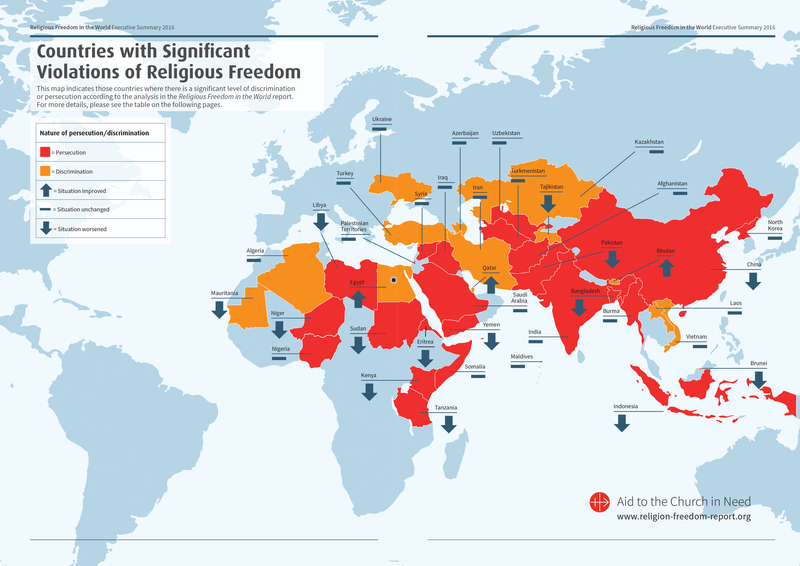 Examining the two-year period up to June 2016, this Religious Freedom in the World 2016 report assesses the religious situation of every country in the world. In total, 196 nations were examined with a special focus in each case on the place of religious freedom in constitutional and other statutory documents, incidents of note and finally a projection of likely trends. Consideration was given to recognised religious groups regardless of their numerical size or perceived influence in any given country. Increasing media coverage of violence perpetrated in the name of religion – be it by Boko Haram in Nigeria, Al Shabaab in Kenya or the Taliban in Afghanistan– reflects a growing recognition about how for too long religious liberty has been “an orphaned right”. Aided by the work of political activists and NGOs, a tipping point has been reached concerning public awareness about religiously motivated crimes and oppression, prompting a fresh debate about the place of religion in society. The frequency and intensity of atrocities against Yazidis, Christians, Baha’is, Jews and Ahmaddiyya Muslims is on the rise, and is reflected in the volume of reportage of extremist violence against religious minorities. In the face of such crimes, it is arguably more important than ever to arrive at a clear and workable definition of religious freedom and its ramifications for government and the judiciary. The focus of this Religious Freedom in the World report is concerned with State and non-State actors (militant or fundamentalist organisations) who restrict and deny religious expression, be it in public or in private, and who do so without due respect for others and for the rule of law. Syriac-Catholic priest Father Jacques Mourad was held by Daesh (ISIS) but escaped after five months. 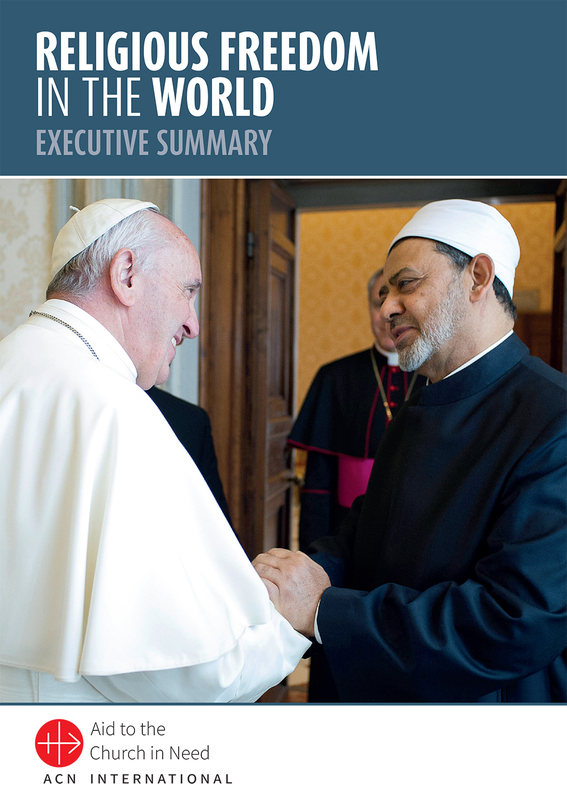 This report sets out to describe the conditions faced by every religious minority in every country of the world. How widespread is religious persecution? Religious liberty has declined in 11 – nearly half – of the 23 worst-offending countries. Since mid-2014, violent Islamist attacks have taken place in one in five countries around the world - from Sweden to Australia and including 17 African nations. Where does most persecution occur? In parts of the Middle East, including Syria and Iraq, hyper-extremism is eliminating all forms of religious diversity and is threatening to do so in parts of Africa and the Asian Sub-Continent. North Korea is the country where persecution is most severe. In parts of the world where there are significant violations of religious freedom, three countries showed an improvement – Bhutan, Egypt and Qatar. Christians remain the most persecuted faith in the world. Muslims also face serious persecution; often from other Muslims who do not share their exact same beliefs. There has been an upsurge of anti-Semitic attacks, notably in parts of Europe. Why are people being persecuted? And in 1 country – India – the persecution was linked to Hindu extremists. In addition, faith groups in the West have experienced increasing hostility and pressure in a society where secularism and atheism have gained prominence. In this region of the world, there has been a growth in acts of hatred and institutional intolerance towards religious groups and the values they uphold.